As I wrote in my column this morning, the Spanish economy is spiralling into debt-deflation. Monetary and fiscal policy are both excruciatingly tight for a country in this condition. The plan to slash the budget deficit from 8.9pc to 5.3pc this year in the middle of an accelerating contraction borders on lunacy. You cannot do this to a society where unemployment is already running at 24.4pc. 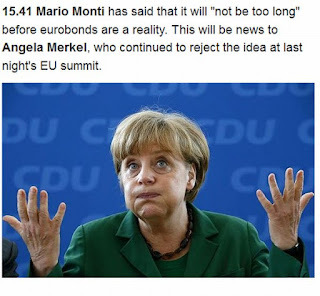 Either Europe puts a stop to this very quickly by mobilising the ECB to take all risk of a Spanish (or Italian) sovereign default off the table – and this requires fiscal union to back it up – or it must expect Spanish patriots to take matters into their own hands and start to restore national self-control outside EMU. Just to be clear to new readers, I am not "calling for" a German bail-out of Spain or any such thing. My view has always been that EMU is a dysfunctional and destructive misadventure – for reasons that have been well-rehearsed for 20 years on these pages. then Germany must leave EMU. It is the least traumatic way to break up the currency bloc (though still traumatic, of course). Ambrose: Spain is spiralling into the vortex of debt-deflation. This has nothing to do with Greece. It is not the result of fiscal extravagance over the past decade, or other such Wagnerian myths. Indeed, the ECB even let the broader M3 money supply contract for the whole eurozone late last year, badly breaching its own 4.5pc growth target. This was not purist hard-money discipline. Let us not dress it up with the bunting of ideology, or false authority. It was incompetence, on a par with the errors of 1931. A €4bn bail-out in mid-May. A €23bn bail-out two weeks later. You couldn’t make it up. "The moment they start saying, 'Don't worry, your money will be safe,' is the moment you should withdraw your money from the bank,"
- Europas politiker har slagit in på en ekonomisk kurs som ser ut att leda mot sammanbrott. - Den globala finanskrisen satte i gång dramatiken, men det vore intellektuellt ohederligt att förtiga den roll som valutan kommit att spela. - Har vi glömt lärdomarna från början av 1930-talet, då president Hoover i USA och kansler Brüning i Weimar-Tyskland stod för ett förödande åtstramningstänkande? Men han har en liten bit kvar. Det är viktigt att byta sida före eurons Stalingrad. Kanske det redan är för sent ? Man skall i alla fall byta sida innan Berlin har fallit. Det är ändå trevligt med personer som tänker i begrepp som intellektuell heder. Alltför många är mer intresserade av att vara i gott sällskap. The basic problem is that many people won’t keep their euros in a Greek bank, and perhaps not in a Spanish bank, either, when those euros can be moved to Germany or some other haven. Yet German citizens do not appear ready to guarantee Spanish banks or, by extension, the whole credit system of Spain and the other periphery nations. Guarantees of that scope are probably impossible and may also require constitutional changes in some nations. We thus face the danger that the euro, the world’s No. 2 reserve currency, could implode. There is also talk of forming a true fiscal union, but that seems to be doubling down on a bad idea. If the euro zone cannot summon enough cooperation now, how is any union requiring tighter cooperation supposed to work? How would national budgets be set and approved? A credit collapse remains a real possibility. It probably is about time to judge the euro zone as a failed idea. Jag har nu förstått att det är viktigt att vara i gott sällskap. Det förstod Mats Johansson för länge sedan. Dag ett som chef för Svenska Dagbladets ledarsida skrev han sin omsvängningsledare om EMU, där SvD bytte sida till Ja-till-EMU. - Till dem, den renade nationalstatens bevarare och isolationister till höger och vänster, kan vi inte sälla oss. Det skulle se ut; SvD på samma barrikad som rasister, nejsägande kommunister, grönpartister och Inger Segelström i en oönskad folkomröstning. Icke. Nog kände jag mig lite förolämpad av detta. Men Mats Johansson, min gamle frontkamrat, är ju inte dum. Därför fanns det med en brasklapp, som han i dag kan åberopa, om han vill. - Spådomen om Europas undergång på grund av just eurons införande har ännu inte infriats. Än så länge, bör väl försiktigtvis tilläggas, eftersom erfarenheterna av euron hittills är begränsade till uppåtgående konjunkturer i många medlemsländer. - Prövningen kommer i sämre tider när inhemska problem uppstår och devalveringsvana, inflationsbenägna politiker skall försöka motverka marknadsmekanismerna med politiska styrmedel som inte längre fungerar i en globaliserad ekonomi, särskilt som räntevapnet på goda grunder givits bort till en självständig riksbank. When Bear Stearns went bankrupt, the immediate question by the market was not how much did we lose, but who is next? As it turned out, it was Lehman. The rest is history. But it was a recent lesson that is still quite vivid in the memory of traders and investors. Grexit calls into question the very existence of the European Monetary Union. Is it a union from which there may be no exit, an "all for one and one for all" union, or is it a club that one can choose to belong to or to leave? Sweeping reforms to shift the burden of rescuing failing banks from taxpayers to bondholders are to be unveiled by the European Commission, despite fears it will further rattle nervous bank investors. Why it is impossible - The Name Is Bond. Eurobond. “The pooling of debt is just one side of a coin where federalism is the other. Common bonds “can only come at the end of a long process, which, among others, would require several states to change their constitution, modification of treaties and the creation of more of a budgetary union,” German central bank chief Jens Weidmann said. The Name Is Bond. Eurobond. Europe's debt crisis gets a new potential hero, with Germany once again cast in the role of villain. Det är finanspolitiken, inte räntan, stupid, skrev jag, senast den 9 april. Nu ser jag att Paul Krugman har skrivit en bok på samma tema: med budskapet : Why the US government should get on with more spending. Boken heter End this Depression Now! och är på 272 sidor. You can argue otherwise, and some economists do, but most evidence from the last few years suggests that Krugman is basically right. If high unemployment was structural then inflation would have started to go up by now. US Treasury bond yields have gone down even as US debt has risen. A preponderance of studies show that, when interest rates are stuck at zero, government spending has a large effect on the economy. Asia showed the world the danger of ill-timed austerity, denial and slavish devotion to conventional economic policies amid very unconventional circumstances. Why, then, is Europe resorting to a crisis-response toolbox that Asia clearly demonstrated doesn’t work? By this point, there should be no debate: Austerity has been a failure, shrinking economies and making it ever harder for indebted countries to repay their debts. Peter Bofinger nailed the issue in the debate on the parallel currency, the “geuro” as proposed by Thomas Mayer. Bofinger says a geuro is worse even than a grexit because it translates prices and wages into geuros, while keeping debts in euros. The country would be immediately bankrupt, and the citizen would revolt. Jonung: ”En parallell valuta i Grekland det bästa"
Att döma av den ekonomiska historien ligger en parallell valuta närmare till hands än att Grekland inför en helt ny valuta. En parallell valuta kräver inget hemlighetsmakeri, den kostar väldigt lite, den kan införas snabbt och den behöver inte skapa panik. Gavyn Davies: A parallel currency for Greece? I am inclined to believe that a parallel currency could only work in a parallel universe, not the one we currently inhabit. It may be just a stepping stone to the inevitable combination of outright default, inflation, and departure from the eurozone which may unfortunately await Greece. But it would be very nice to be wrong about this. For two crisis-plagued years Europe’s leaders have run away from this choice. They say that they want to keep the euro intact — except, perhaps, for Greece. But northern European creditors, led by Germany, will not pay out enough to assure the euro’s survival, and southern European debtors increasingly resent foreigners telling them how to run their lives. Only if Europeans share a sense of common purpose will a grand deal to save the single currency be seen as legitimate. Only if it is legitimate can it last. If it is to banish the spectre of a full break-up, the euro zone must draw on its joint resources by collectively standing behind its big banks and by issuing Eurobonds to share the burden of its debt. Rumours of bank runs around Europe’s periphery have put savers and investors on alert (see article). The euro zone needs a plan. More likely, a break-up would take place amid plunging global share prices, a flight to quality, runs on banks, and a collapse in output. Capital controls are illegal in the EU and the break-up of the euro is outside the law, so the whole union would be cast into legal limbo. Is the euro really worth saving? Even the single currency’s diehard backers now acknowledge that it was put together badly and run worse. There would be so many people to blame: Eurocrats, financiers, intransigent Germans, feckless Mediterraneans, foreigners of all kinds. As national politics turned ugly, European co-operation would break down. That is why this newspaper thinks willingly abandoning the euro is reckless. A rescue is preferable to a break-up. Fear that the state could not cope makes a banking collapse more likely. That is why we have reluctantly concluded that the nations in the euro zone must share their burdens. For people like Germany’s finance minister, Wolfgang Schäuble, the single currency was always a leg on the journey towards a fully integrated Europe. Voters will be scared into grudging acquiescence precisely because a euro collapse is so terrifying. Bloomberg: Would it surprise you to know that Europe’s taxpayers have provided as much financial support to Germany as they have to Greece? An examination of European money flows and central-bank balance sheets suggests this is so. Let’s begin with the observation that irresponsible borrowers can’t exist without irresponsible lenders. Germany’s banks were Greece’s enablers. Thanks partly to lax regulation, German banks built up precarious exposures to Europe’s peripheral countries in the years before the crisis. By December 2009, according to the Bank for International Settlements, German banks had amassed claims of $704 billion on Greece, Ireland, Italy, Portugal and Spain, much more than the German banks’ aggregate capital. In other words, they lent more than they could afford. When the European Union and the European Central Bank stepped in to bail out the struggling countries, they made it possible for German banks to bring their money home. As a result, they bailed out Germany’s banks as well as the taxpayers who might otherwise have had to support those banks if the loans weren’t repaid. Unlike much of the aid provided to Greece, the support to Germany’s banks happened automatically, as a function of the currency union’s structure. Why the sovereign debt of eurozone countries seem to be far more fragile than that of countries with their own central banks, skrev Martin Wolf i Financial Times den 23 maj 2012. A member of a currency union does not have a central bank of its own. This then creates liquidity and default risk in the market for government bonds. Without a central bank, a time may arrive when the government is unable to refinance its debt. That creates tail risk – the likelihood of being trapped in debts whose maturity will be forcibly extended or on which the government will default. Paul de Grauwe has put the point forcefully, skriver Wolf. Members of a monetary union issue debt in a currency over which they have no control. It follows that financial markets acquire the power to force default on these countries. This is not the case in countries that are no part of a monetary union, and have kept control over the currency in which they issue debt. These countries cannot easily be forced into default by financial markets, vilket, tycker jag, kan översättas med "Om man har en sedelpress går man inte i konkurs". – and would invite a nationalist backlash across Europe. I had written repeatedly that the eurozone was a flawed construction that was likely to collapse. If that was the case, I was asked, would it not be better to break the whole thing up now? But prevarication is no longer good enough. In the coming months, Europe may be forced to decide. It is true that the transition from here to there will be painful and dangerous. My colleague Martin Wolf laid out an updated version of the full horror scenario in Friday’s FT – involving a breakdown of law and order in Greece, and financial collapse across Europe. How could anyone responsibly run that risk? The answer is that the alternatives to eurozone break-up are inherently implausible and deeply unattractive. Without the option of devaluing their currencies, uncompetitive economies are left with “internal devaluation” – otherwise known as wage cuts and mass unemployment. It is true that countries such as Greece badly need economic reforms. But these reforms – conducted within the straitjacket of monetary union with Germany – are causing political and economic turmoil. 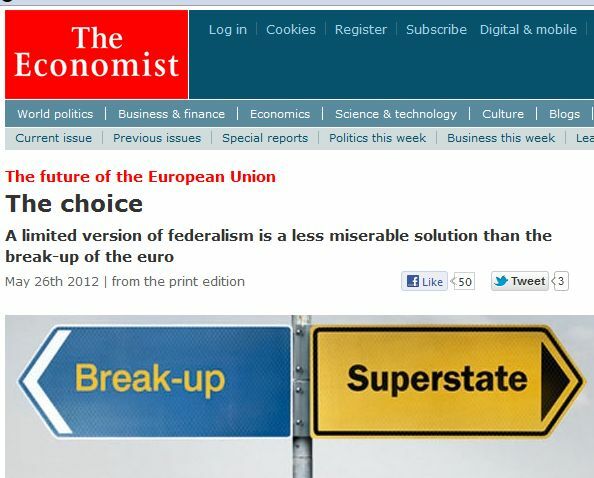 In theory, the eurozone might rectify this error by moving to a real political union. Even if EU politicians were able to overcome such objections and create a real federal union, this giant new entity would essentially hollow out the powers of national democracies. Sacrificing national self-rule on the altar of the euro is inherently objectionable – and would invite a nationalist backlash across Europe. Tänk vad en del är duktiga. Those readers who have been berating me for years for even considering the possibility of a country leaving the euro have recently fallen silent. You may think this is premature. Personally, I have always thought that if you are going to be a forecaster you should specialise in being early. What should be the stance of the British government? Its view has been that a break-up of the euro would be a disaster, even to the extent of supporting moves towards full fiscal and political union to prevent it. This strikes me as completely wrong. European history has been about various powers trying to dominate the continent and Britain trying to stop this. First it was Spain, but in the last four hundred years it has been either France or Germany. Now we have both trying to do it together, with Spain and the others in tow! There is a tendency for our governing elites to identify the interests of Europe with whatever European institutions currently exist and with whatever euro-twaddle is spouted by the people in power in Europe at the time. This is profoundly misguided. The most pro-European thing anyone can do now is to reject the euro. Nyligen hade jag här ett inlägg med rubriken "Grekland, Mercedes, Staten och Kapitalet". En kvinna i Grekland har köpt en Mercedes. Daimler-Benz AG har fått sina pengar för bilen. Det är någon bank, kanske Deutsche Banks filial i Grekland, som, dumt nog, har lånat ur pengarna till kvinnas bilköp. Kanske bankerna har ett ansvar, var min tanke. Nu läser jag en artikel av ingen mindre än Mohamed A. El-Erian. Jag tror på Mohamed. brukar jag säga. Här ett utdrag med länk. Hold on, I hear you say. For every debt incurred there is a credit extended. You are right. Greece’s private creditors were more than happy to pour money into the country, only to shirk their burden-sharing responsibilities when the artificial boom could no longer be sustained. The over-lending was so widespread that at one point it drove down the yield differential between Greek and German bonds to just six basis points – a ridiculously low level for two countries that differ so fundamentally in terms of economic management and financial conditions. Remember, the large core economies (France and Germany) were among the first members to breach the budgetary rules that were established when the euro was launched. Most likely, they will end up getting off too easy, especially compared to the real victims of this historic tragedy – the most vulnerable segments of the Greek population, who will become much worse off, today and for many years to come, as jobs disappear, savings evaporate, and livelihoods are destroyed. And they may not be alone. Millions of others may experience collateral damage, as financial contagion risks spreading to other European countries and to the global economy as a whole. In a fairer world, these vulnerable citizens would be entitled to claw back the salaries, official privileges, and bonuses that the four parties to blame enjoyed for too long. In the world as it is, they are a compelling lesson for the future. The UK is not going to leave the European Union. Of course not. British Deputy Prime Minister Nick Clegg: The UK is not going to leave the European Union. Of course not. We are inextricably wound up with Europe. In terms of culture, history and geography, we are a European nation. SPIEGEL: Does your euroskeptic coalition partner, Prime Minister David Cameron's Conservative party, agree with that? Clegg: Of course. The Conservatives don't believe in leaving the European Union. SPIEGEL: But the electorate does. Polls indicate that a clear majority would vote in favor of leaving the EU, if there was a referendum. Clegg: Opinion polls across the EU -- in the Netherlands and in the south (of Europe) -- are showing a growing disenchantment with the EU as a whole. The UK is by far not alone in this regard. We are losing faith in the EU and its institutions -- for understandable reasons, considering the economic problems we face. But that doesn't mean that it makes sense to forecast the breakup of the EU as a whole. SPIEGEL: Isn't that quite elitist? We carry on, regardless what our electorates say? Clegg: Not at all. Far from it. Samarbetet i EU bygger på en metod som introducerades av Frankrikes utrikesminister Schuman. Det fanns dock en konflikt inbyggd i den överstatliga unionen ända från början, och det visste Schuman. Att begränsa medlemsstaternas suveränitet var ingen liten sak, ens för honom. Despite efforts at official reassurance, no one really knows the consequences of a Greek exit from the euro zone, or how rapidly big countries like Spain and Italy, and their banks, will feel the effects. Münchau: Article 66 of the Treaty can be invoked to stop Greek outflows to Switzerland, but not to Germany, at least not legally. Article 66 of the Treaty on the Functioning of the European Union says the freedom of capital movement can be suspended but only in relation to third countries. 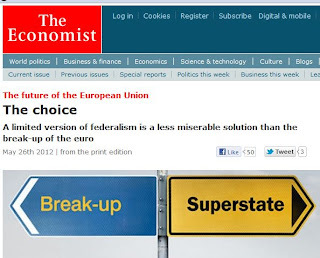 The article can be invoked to stop Greek outflows to Switzerland, but not to Germany, at least not legally. That is one of the reasons why a eurozone exit cannot be legally accomplished inside the EU. Utan den reduceras samarbetet till ett frihandelsområde, mindre långtgående och mindre betydelsefullt än den politiska union som med en gemensam valuta möter globaliseringens utmaningar. – Jag skulle vilja se ett större och enklare Europa. EMU-anslutningen. – Det är inte rätt tid att väcka den frågan just nu. Kenneth Bengtsson beskriver situationen i Europa som ett stålbad – inte minst för de sydeuropeiska länderna ­– och som en svår en prövning för hela EU-samarbetet. – Jag tillhör dem som tror att det alltid kommer något gott ur en kris. Att en kris snarare svetsar samma på sikt även om det blir ett hack i kurvan just nu. - Men det finns goda föredömen, som exempelvis Lettland. Inför euroomröstningen för nio år sedan var Svenskt Näringsliv en av de mest ivriga påskyndarna för en svensk anslutning. I dag är tonen en annan. – Det är inte rätt tid att väcka den frågan just nu. Men ska vi ha ett starkt Europa krävs också i fortsättningen en stark gemensam valuta. Anledningen var en artikel av Peter Wolodarski som var mycket bra, för att komma från en tidning, som, likt Svenska Dagbladet, är för en svensk EMU-anslutning. Wolodarski är i alla fall så intellektuell att han uppenbarligen våndas inför eurokrisen. - Om Grekland faller – vilket verkar troligt – kan mycket väl Spanien, Portugal, Italien och Irland stå på tur, varnar han för. - Den ordinerade krismedicinen, i praktiken ekonomisk svält, fungerar lika illa i Grekland som i Argentina 2001, skriver han. - Inget talar för att besparingarna får fart på tillväxten inom överskådlig tid eller att väljarna accepterar utvecklingen, konstaterar han. Vad skall då en fattig Ja-sägare göra? - Fortsätta skriva av skulder, samtidigt som ECB tillåter högre inflation och ser till att det europeiska banksystemet fortsätter att fungera, är Wolodarskis förslag till ny strategi. Har han tänkt på vad de andra krisländerna, Portugal, Italien, Irland och Spanien skall säga? De kommer naturligvtis att fråga varför "den ordinerade krismedicinen, i praktiken ekonomisk svält" skulle fungera i deras länder om den inte fungerar i Grekland. Tal om ytterligare skuldnedskrivningar går inte bra hem hos bankerna och de andra långivarna. Det skulle bara gälla Grekland och det skulle vara en gång. Har Wolodarski tänkt på att den strategi han förespråkar kommer att ta flera år för att Greklands konkurrenskraft kan återställas? Det ordnade sig för Argentina, men inte förrän den övergett den fasta växelkursen. While there are many similarities between the Greek and the Argentine experiences, as a member of the Eurozone, Greece cannot inflate (and reduce its real debt burden) and it cannot devalue its currency. This is a severe constraint. Det har han säkert tänkt på. Men har ju en spärr. Han kan inte ta det sista avgörande steget och medge att eurokrisen beror på euron. Det blir nog ändå så att alla uppoffringar det grekiska folket gör ändå inte kommer att lyckas, i meningen att Grekland åter blomstrar och samtidigt är kvar i eurozonen, EZ. Kanske bereder Peter Wolodarski med sina senaste artiklar vägen för en omläggning av tidningens linje om att Sverige bör gå med i euron? Heder ändå åt Wolodarski som i alla fall inte gör som P J Anders Linder i Svenska Dagbladet, som månad efter månad tiger om eurokrisen långt mer än som är förenligt med god publicistisk sed för en ledaravdelning. För detta tigande har han belönats av sina uppdragsgivare med Nicolinpriset. Contrary to what some people may think, I don’t regard anyone who disagrees with me as necessarily a mendacious idiot. Economics is hard, and people will disagree. Sometimes people will give advice with the best of intentions that turns out, in hindsight, to have been disastrous; that’s a tragedy but not a sin. But here’s what is indeed a sin: choosing your position based on what is personally convenient. - Even recently, “leading economists” would look at you askance when you were talking about possible eurozone break-up, insisting your views were “mad”. - We public non-believers have endured character assassination, whispering campaigns, the whole shebang – I kid you not – as we challenged a system built, not on economic logic, but on political hubris and vanity. Man behöver inte tro på Keynes teorier från 1930-talet för att se både den politiska och ekonomiska faran i en finanspolitik som spär på nedgången Det långsiktigt nödvändiga – att sanera skuldsatta ekonomier – är inte en klok strategi i ett akut läge. - På kort sikt behövs dessvärre mer stimulanser och hjälp till banksystemet för att ekonomin ska kunna växa, tillade han. Tidsandans kraft är stor. Peter Wolodarski anser sig behöva ta avstånd fron Keynes, 1900-talets främste ekonom. - Man behöver inte tro på Keynes teorier från 1930-talet för att se både den politiska och ekonomiska faran i en finanspolitik som spär på nedgången, skerv han. Men däri har han fel. Antingen, kan man, som Hoover och Brüning och Angela Merkel, anse att nedskärningar i statens utgifter och skattehöjningar, som leder till balans i statsbudgeten, är den rätta vägen. Eller, kan man som Keynes och Peter Wolodarski anse att den bortfallande efterfrågan, som framkallat krisen, bäst möts med en kompenserande ökning av statens efterfrågan. Man behöver tro på Keynes teorier från 1930-talet för att se både den politiska och ekonomiska faran i en finanspolitik som spär på nedgången. Peter Wolodarskis artikel var alldeles utmärkt. Det var bara ett inte för mycket. - Det är lätt att förstå att väljarna sparkat ut de inkompetenta mutkolvar som styrt landet i fyra decennier, hette det i en DN-ledare häromdagen, signerad Gunnar Jonsson. Men det är till dessa partier, inkompetenta mutkolvar, som Dagens Nyheters ledarredaktion sätter sitt hopp. Varför använder inte euroanhängarna bättre argument, kan man undra. Svaret är givetvis att dom inte har bättre argument än så. En kvinna i Grekland har köpt en Mercedes. Daimler-Benz AG har fått sina pengar för bilen. Banken har nu bekymmer. Men skall vi lägga skulden på den grekiska kvinnan som fick lån i sin bank, köpte en bil och fortfarande amorterar på lånet, om hon numera inte har blivit arbetslös? Kanske den Moral Hazard som spökar i debatten inte alls handlar om greker, utan, som vanligt, om inkompetenta och överbetalade bankdirektörer? Det var pinsamt att i dag lördag på Ekonomiekot höra Cecilia Hermansson, chefekonom på Swedbank debattera eurokrisen med Stefan de Vylder. Hon låter som Annie Lööf, klyschorna rinner ur munnen. Till hennes försvar kan anföras att hon har en svår uppgift, att försvara regeringens, Löfvens och sin arbetsgivares uppslutning kring euron. Och hon vill väl behålla jobbet. Kanske kan hon därmed också med tiden kanske få Nicolin-priset, likt P J Anders Linder. Vilken fråga som än ställs blev Cecilas Hermanssons svar detsamma, "Strukturreformer". Hon lyckas få med tre "strukturreformer" på en inandning. Hon medger att det kommer att ta några år innan strukturreformerna får effekt. Kan hon verkligen tro att Grekland, Portugal, Spanien och Italien har flera år på sig? could come apart at the seams. Things could fall apart with stunning speed, in a matter of months, not years. For the first French empire and the Nazi empire the moment historians call “imperial overstretch” is simple to spot: they both invaded Russia. Historians will long debate the hubris moment for the Roman empire. For my money, it was when Diocletian established the Tetrarchy in 293AD, splitting the empire into four, a classic sign of hubris. So when was it that the Brussels empire over-reached, and became more concerned about its own expansion and glory, its own ambitions for hegemony, than about the daily economic wellbeing of its citizens? The European Economic Community’s Edinburgh Conference of December 11 and 12, 1992. It was then, after the Danes had rejected the Maastricht treaty the previous June, that the EU decided not to take their no for an answer. Too much was bound up in the project, too many hopes of one day supplanting the US as the top-dog world economic power were invested in it, to allow a small country like Denmark to derail it. On November 1, 1993 the EEC became the EU and a political entity on the world stage. Germany and France should, therefore, in as orderly and honourable a way as they can, return to the safety and the rationality of the original Treaty of Rome, reinstitute the “six”, and keep the euro only for those countries that deserve membership on the logical grounds of genuine economic synergy. These are utterly removed from the commission’s hubristic fetish of global hegemony. It is an article of faith in Berlin that the single currency must survive, whatever the cost. or a community of fate, a historic task that Germans must carry out whatever the costs. The idea that Germany will throw its hands in the air in disgust at recent developments, and give up on the whole thing, is almost certainly misguided. It’s curious, to put it mildly, that a country as fastidious as Germany should have committed itself to an economic experiment as dysfunctional as European Monetary Union. But as Angela Merkel has said, the euro is more than just a currency. “The euro is our common fate, and Europe is our common future,” sade Förbundskansler Merkel,enligt Financial Times. "In the autumn of 2011, the conditions were very dangerous," one of its executive directors, Benoit Coeure, told me. which would have also led to a collapse in the economy and to deflation. And this is something that the ECB could not accept." or a disastrous monetary and political disintegration? Jean-Claude Trichet - president of the European Central Bank during many of the euro's formative years - made a similar point. "In a single market with a single currency… it seems to me that Europe could go for a federation." A Greek exit from the euro area has the potential to be the European Union’s most economically and politically destructive event of a generation. Unfortunately, Europe has reached the point where it must prepare for such an outcome. First, Europe would have to absorb immediate losses on money lent to Greece. The country has about 400 billion euros in external debts, which its government, banks and companies would probably pay only in part or in drachmas. Second, European officials would need a plan to stop bank runs. As soon as Italian, Portuguese, Spanish and maybe even French depositors see footage of Greeks clamoring for their savings, they’ll want to get their euros out of local banks as quickly as possible. Bank holidays and bans on withdrawals would help only temporarily. To prevent a collapse of the banking system, Europe’s leaders would have to guarantee all deposits in euro-area banks, a move that would put Germany and other core countries on the hook for insuring more than 3 trillion euros in Italian and Spanish deposits. Common deposit insurance would also require euro-area governments to achieve in a matter of days a harmonization of banking regulation that has escaped them for more than a decade. "most economically and politically destructive event of a generation"
Om att äta kakan, ha den kvar, eller sälja den på kredit till Grekland. Man kan inte både äta kakan och ha den kvar, brukar våra vanligaste ekonomer och politiker säga. Det är ju sant. Men varför skulle jag vilja ha kakan kvar? Den blir bara gammal. Nej, jag säljer den i stället till Grekland på kredit. Den skattefuskande köparen i Grekland får ett lån av den grekiska banken för att köpa kakan (eller Mercedesbilen). Jag får mina pengar, köper en annan kaka, och äter upp den. Nu ingår skulden för kakan i den grekiska utlandsskulden. Låt oss utreda exakt hur det gick till. Låt oss säga att kakan kostade en euro. Den åts ju upp i Grekland, som, tyvärr för grekerna, ingår i eurozozen (EZ). Den grekiska banken utbetalade en euro till den kakätande skattefuskande greken. För att fylla på sin kassa lånar banken en euro av sin centralbank,den grekiska centralbanken (som är en NCB, National Central Bank, en centralbank utan sedelpress. Eftersom den grekiska NCB inte har någon sedelpress måste den låna en euro av ECB. Den grekiska centralbankens skuld till ECB på avräkningskontot Target 2 har ökat med en euro. Sedan visar det sig, besynnerligt nog till allmän förvåning, att Greklands utlandsskuld har blivit jättestor. Marknaden kräver högre räntor för att rulla runt sina lån till Grekland, ett land utan egen sedelpress. Ledarna för EZ, här symboliserad av Peter Altmaier, Chief Whip and leader of the German CDU/CSU parliamentary group, samlas för att dryfta den uppkomna situationen. Det kommer inte på fråga att skriva av ECBs fordran på en euro för kakan, anser Altmaier et consortes, eftersom det skulle drabba skattebetalarna. I stället kräver man att Grekland skall skära ner sitt budgetunderskott genom sänkta pensioner och höjda skatter, kort sagt göra en interndevalvering. Grekland håller val varvid de partier som är för en sådan förlorar. Regeringsförhandlingarna misslyckas, nyval skall hållas och en tjänstemannaregering tillsätts. Men vore det så förskräckligt om den grekiska skulden skrevs av? Tyska och andra skattebetalare skulle stå för notan, sägs det. Men Tyskland skulle ju kunna låna en euro hos ECB och med det betala den bank i Grekland som lånat ut en euro till den kakätande grekiske skattefuskaren. Då skulle Tysklands nettofordran inom Target 2 sjunka med en euro. Men vem skulle lida av det? "Det finns ingen anledning till oro"
“Provopoulos told me that of course there’s no panic but there’s great fear which can evolve into panic,” the president said. Banks in downtown in Athens were open as normal today with no signs of unusual activity. Peston, BBC: Could the euro survive a Greek exit? Could the euro survive a Greek exit? Any business of any nationality will find it extremely difficult to leave its money in euros in a bank in a country perceived to be at risk of following Greece out the door. Citizens too, if they are able to do so, have a huge economic incentive right now to take their money out of Greek banks, and either hold it in cash or transfer it to a perceived safe haven, such as Germany. A Greek departure from the euro, which accelerated withdrawal of cash from banks in other vulnerable economies, would surely create the imperative for yet more emergency ECB lending to banks. And since the European Central Bank and the national central banks insist on lending only in return for collateral, there is a danger that banks would shortly run out of collateral of sufficient quality. Which means the ECB would face the uncomfortable choice of turning off the life support, and see quite a few banks falling over, or lending on the basis of inadequate security - and thus taking significant credit risks with these loans. Ungefär en femtedel av länets invånare kommer från ett annat land. Der Spiegel: It's time to admit that the EU/IMF rescue plan has failed. Greece's best hopes now lie in a return to the drachma. It's time to admit that the EU/IMF rescue plan has failed. Greece's best hopes now lie in a return to the drachma. At the Chancellery in Berlin, the television images from Athens now remind Merkel's advisers of conditions in the ill-fated Weimar Republic of 1919-1933. And, as in the 1920s in Germany, the situation in Greece today benefits fringe parties on both the left and the right. The country's political system is unraveling, and some advisers even fear that the tense situation could lead to a military coup. Det är väl mer fråga om veckor, dagar eller timmar? Who is winning the argument in Europe on austerity, growth and the connection between the two? I had a lively debate on this question this week with the BBC's veteran diplomatic correspondent James Robbins on the World Service. I use the word "veteran" advisedly, but as James reminded us, he has been covering European issues for so long, he was there in Maastricht in 1992, when the basic rules for the single European currency were first agreed and signed into law. In the programme we also heard from some distinguished economists from around Europe, all with a slightly different take. If they can persuade the German Chancellor that it makes sense, even from the standpoint of the public finances, to balance budgets over a longer time frame, they might actually be able to reach a deal. Lest we forget, this was precisely the argument that Germany made to its European partners a decade ago, in explaining why it was not going to get its budget deficit back to below 3% overnight. Germany's deficit was above 3% in 2001, 2002, 2003, 2004 and 2005. Perhaps all Chancellor Merkel needs is a helpful reminder? Det hon skriver- 2012-05-12 - är så förvirrat att man hade bort låta det passera, om det nu inte var så att hon är Aftonbladets politiska chefredaktör. Som sådan har hon till uppgift att, liksom Peter Wolodarski och P J Anders Linder, försvara regeringens och S-ledarens linje att Sverige bör gå med i det som kallas euro-samarbetet. - Grekiska politiker har svikit sina väljare i decennier. Europas ledare blundade i sin tur när de grekiska statsfinanserna inte höll måttet, skriver hon. Det är bra. Hon medger således att dom inte blev lurde. Dom blundade. - Euron skulle vara ett politiskt projekt. Men av det finns inte mycket kvar. Folket är bara till besvär. De röstar fel, protesterar, blir desperata. Så vad händer nu? En bra fråga utan bra svar. - För ekonomerna är det lätt, påstår hon. - På ena sidan åtstramningsfundamentalister som Anders Borg. - På andra sidan euroskeptikerna. Som ser krisen som ett bevis för att EMU-projektet är omöjligt. Som tror att Greklands utträde ur euron är oundvikligt. Hur skall hon nu välja sida? - Ekonomerna har tröttnat på de bråkiga grekiska väljarna. Det gör mig livrädd, skriver hon. Men hon ser ljus i tunneln. - Kanske är något på väg att hända. Nye franske presidenten Hollande kräver en tillväxtpakt. Men det har ju EU sedan länge - Stabilitetspakten, sedermera omdöpt till Stabilitets- och Tillväxtpakten, numera i Europakten. - Och i veckan meddelade den tyska centralbankschefen att han kan tänka sig att låta inflationen stiga, och därmed lönerna och efterfrågan på varor från länder som Grekland. - Frågan är om det räcker. Det är väl så kritisk hon kan vara och ändå behålla jobbet. Det skall bli intressant att se vad P J Anders Linder och Peter Wolodraski skriver i ämnet. Det är kanske lustigt, men mest pinsamt, att se chefredaktörerna vrida sig som maskar. Regeringen, liksom S-ledaren, är för ett svenskt medlemskap i EMU. Den uppfattningen delas av runt tio procent av det svenska folket. Regeringen, liksom S-ledaren, saknar stöd bland folket. De saknar därmed legitimitet, vilket bör rättas till. Regeringen bör därför utlysa nyval och Allians-regeringens partier, liksom S-ledaren, kan då vädja till folket om stöd för sin linje om att införa euron. Ett konstigt förslag tycker många. – Som det är nu, om någon mätte med våra frågor så skulle jag tro att det skulle vara ännu svagare stöd för euron. Men nu är den så jätterekordlåg så det är svårt att komma lägre, säger professor Sören Holmberg. Men sanningen är ju den att den svenska regeringen, inklusive Anders Borg, och dessutom S-ledaren Löfven och Dagens Nyheter och Svenska Dagbladet och alla andra eurokramare, fortfarande håller fast vid den analysen. Jodå, men om dom sade att eurokrisen berodde på euron skulle de vara tvungna att erkänna att de har haft fel om euron i tio år. Det är därför dom talar mot bättre vetande. Det finns ett verb för sådant. Despite belated gestures from Berlin, the single currency cannot survive if and when Greece leaves it. Greece’s motorcycling Marxist, Alexis Tsipras, makes an unlikely champion, with his commuter leathers and largely unrealistic Left-wing views, but he seems to be about the best of a bad bunch right now. as part of an economic rebalancing in the eurozone that would boost the international competitiveness of countries worst-hit by the region’s debt crisis. Bank bailouts on this scale may well bring the Spanish state to its knees. If they don’t, Spain’s public and external debt positions will. In order to stabilise its public debt levels after a bank recapitalisation, Spain would have to generate a swing in its public finances that is not only unrealistic, but also self-defeating. The tax rises and spending cuts required would make the recession deeper and cause the primary balance to deteriorate. Greece’s political chaos thrust Europe into a perilous new phase. Utrikesministern, EU-ministern och många, många fler finns på plats för att diskutera aktuella frågor. Arrangör: EU-kommissionen i Sverige, Europaparlamentets informationskontor i Sverige, Företagarna, LO, Regeringskansliet, SACO, Stockholms Handelskammare, Svenskt Näringsliv, SKL och TCO. Liksom sommaren 1940, innan Spitfires och Hurricanes hade stoppat Luftwaffe, många i England ville ge upp och i stället göra upp med Hitler-Tyskland. När den tyska armén segerrikt rullade österut mot Stalingrad var det skamligt många i Sverige som förberedde sig och Sverige för en tillvaro i ett av Tyskland dominerat Europa. Nu är det skamligt många i Sverige som förbereder sig och Sverige för en tillvaro i ett av EMU-EU dominerat Europa. Varför skall man göra sig omöjlig till ingen nytta när man kan vara realist och få ett välbetalt jobb i Bryssel eller i varje fall få åka dit med någon svensk delegation? Motstånd är ju ändå meningslöst, tänker väl Herr Unckel och andra. Men, som alla svenskar vet, varje meddelande om att motståndet skall uppges är falskt. Det är inte dom som kommer att segra, det är vi. Likt det en gång mäktiga Sovjetunionen kommer den Europeiska Unionen att i efterhand ses som en papperstiger, som ett snarast oförklarligt historiskt misstag likt Första Världskriget. Det socialdemokratiska ungdomsförbundet SSU har antagit ett nytt program där ordet socialism inte finns med. Allt var således fel från början. Det var ingen bra idé, inser man nu, att försöka införa socialism. Det var ingen bra idé, kommer man att säga, att försöka göra Europas länder till delstater i en europeisk Union. Vid sidan av flaggan, hymnen, mottot och den gemensamma valutan (euron), betraktas den 9 maj (Europadagen) som en symbol för Europeiska unionen som politisk enhet. Europadagen firas med aktiviteter och festligheter som för Europa närmare sina medborgare och unionens folk närmare varandra. Förslaget som kallas för "Schumandeklarationen" anses ha lagt grunden till det vi nu kallar Europeiska unionen. Välkomna till Europahuset, Regeringsgatan 65, plan 2, onsdag 9 maj.
Kom och lyssna på seminarier om aktuella EU-frågor som anordnas under hela dagen i Europahuset i Stockholm. Utrikesministern, EU-ministern och många, många fler finns på plats för att diskutera aktuella frågor. Dagen avslutas med mingel. Bostadspriserna i Sverige har ökat mycket kraftigt de senaste femton åren och många svenskar har lånat stora summor för sina hus. Även när tillväxttakten nu är långsammare är bostadspriserna fortsatt höga och många människor har fortfarande mycket höga lån. Kommissionen kommer nu att genomföra en fördjupad analys av Sveriges potentiella makroekonomiska obalanser. Om situationen i Sverige anses riskfylld kommer kommissionen att ge råd och rekommendationer om hur man löser problemen, skriver chefen för EU-kommissionens representation i Stockholm, Pierre Schellekens.